Marbled sculpin, approximately 7.5 cm (3”) long, taken by Lisa Thompson and Daniel J. Drake (dorsal view). Location: Shasta River, California. Date: 12/16/2003. PLEASE NOTE: The photos and information shown here are for the species Marbled Sculpin, of which the Bigeye Marbled Sculpin is a sub-species. Marbled Sculpin are usually found in cold (<20°C) spring-fed streams that have a low gradient and adequate aquatic vegetation. They tend to occupy pools or runs with cover, where optimal temperatures might be 11-15°C. Temperatures above 15°C are considered stressful, while sustained temperatures at 25-27°C are considered lethal. 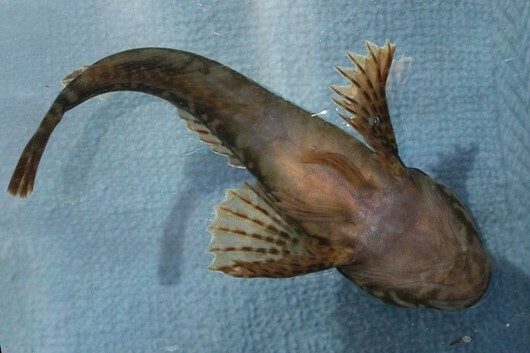 In some isolated streams Marbled Sculpin are found to have greater temperature tolerances and may be found inhabiting riffles or shallow water. Marbled Sculpin develop primarily from spring through fall each year with the largest annual growth occurring in the first year of life. After 2 years the Sculpin are able to reproduce and spawning occurs from late February through March. Each female only produces 139-650 large eggs which are placed in nests under the protection of rocks. The males guard the nests which may contain eggs from multiple females. When the larvae hatch they are 6-8 mm long and fully capable of swimming. However, young Sculpin tend to minimize vulnerability by staying close to the nest site. 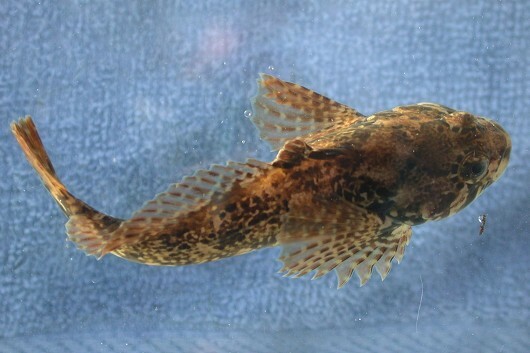 Marbled Sculpin typically live up to 5 years.